Ben Haring, Halah.am on an Ostracon of the early New Kingdom? Journal of Near Eastern Studies, 74, 2 (2015) 189-196. Thomas Schneider, A Double Abecedary? Halah.am and 'Abgad on the TT999 Ostracon. Bulletin of the American Schools of Oriental Research, 379 (2018) 103-112. H.-W. Fischer-Elfert, and M. Krebernik, Zu den Buchstabennamen auf dem Halah.am-Ostrakon aus TT 99 (Grab des Sennefri). Zeitschrift für ägyptische Sprache und Altertumskunde 143 (2016) 169-176. 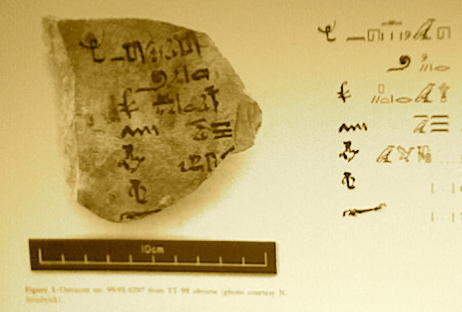 The document that Ben Haring and the other scholars are examining is Ostracon no. 99.95.0297 from Theban Tomb TT99, the burial place of an Egyptian named Senneferi; and it is being hailed as “the earliest known abecedary” (Universiteit Leiden News & Events). The use of the term ‘ostracon’ is far removed from the original meaning (a potsherd with names of people to be ostracized, or voted for). 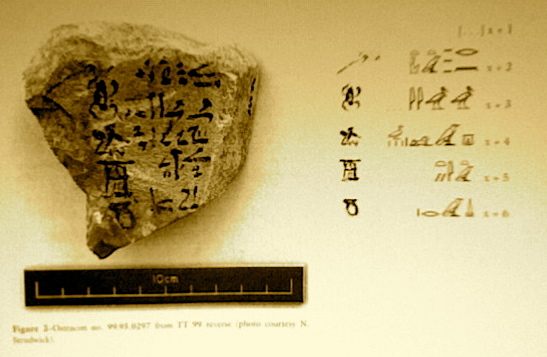 The news report from Leiden University called it a”shard of pottery”, but it is actually a small piece of limestone with an ink inscription on each side; thus it is a tablet with Egyptian writing on it. Note carefully that Haring has a question mark in the title, and he is asking whether the items in this text are arranged in an alphabetical order, following the sequence that starts with HLH.M, as opposed to the familiar ’Aleph Beth Gimel Daleth scheme (originally ’BGHD). Note that Thomas Schneider is now suggesting that both systems are in evidence, with the 'ABGAD sequence on the other side. Anticipating the answer to Haring’s question: what we find is a list of words (nouns rather than names, apparently) with the first four having the initials HRH.M; this looks like a failed hypothesis already, but in Egyptian writing there is no L-sign or l-sound available, so r is used for l (though we will need to keep in mind that l could also be transcribed by n, nr, and 3 [’aleph]). The HLH.M sequence-order for the letters is not known before Hellenistic times in Egypt (4th Century BCE onwards; cp. Schneider 106b) but it is attested in Syria-Palestine in the Bronze Age (before 1200 BCE) and in Arabia in the Iron Age. Is this an onomasticon (a list of names or words) or an abecedary (an inventory of alphabet letters arranged in a standard order)? If it is an onomasticon, why is it being hailed as the earliest known abecedary? Nevertheless, it could be both, because each word has a symbol after it, and some of them look like letters (‘pictophonograms’) of the original alphabet. But the total number of such symbols on this fragmentary document is twelve, a long way from the expected double dozen or more; but Haring (195a) surmises that the ostracon was originally twice as long as the surviving fragment; Wilson-Wright also supposes it was a complete HLH.M alphabet (though this is unlikely or impossible, I will argue). It must be said at this point that none of these scholars mention the oldest complete copies of the early alphabet in its pictorial stage (two inventories on three limestone tablets) which also come from Thebes, and should be cited in any study of the infant alphabet; but, astonishingly and deplorably, they are never consulted (though Émile Puech informs me that he has looked at them in the past), even though they may provide the solution to all the speculation that goes on in the search for the original letters of the alphabet (by Gordon Hamilton, for example). However, they have been examined by myself, publicly though not ‘publicationally’, in connection with the theories of Colless and Hamilton. We now begin an examination of this promising artefact. Photographs of each side are reproduced here (after Haring), and for my own use I have produced a paper facsimile of the objecr, by pasting photocopies of the two sides together back to back. Since Haring (192) gives strong indications that “Group Writing” (Egyptian “syllabic orthography”, a system for transcribing foreign words and names) is present here, we might expect the texts to be Semitic; but he has little success in taking this approach. However, I will presume at the outset (with hindsight) that the words are West Semitic, and that the original pictophonograms that I have proposed for the letters HLH.M (and some others) are there on the tablet. Haring identifies the sides as obverse (A) and reverse (B), and he notes that the top of A corresponds to the bottom of B; and so the writer must have turned the object over vertically to continue the inscription, rather than simply turning it around horizontally so that the top lines of each text are at the top of each side. The text on A is (apparently) broken off at the bottom, and B possibly (though not probably, if Schneider's interpretation is right) has some details missing at the top. The question remains whether the tablet was originally much larger, containing the entire alphabet, and thus with twice the number of letters (22 or more). The sign on the left is a hieratic form of Hieroglyph A28, which is believed to be the basis for proto-alphabetic H /h/ and the origin of Greco-Roman E. It represents a man rejoicing, and my long-standing hypothesis (1988: 35-36) connects it acrophonically with West Semitic hll (rejoice, exult, jubilate, celebrate, as in hallelu-yah). The various shapes it has in the inscriptions also relate it to A32 (man dancing) and even A29 (man standing on his hands). Haring's transcription of the accompanying text (on the right, and reading from right to left) is h3whn; he supposes this is for Egyptian hy hnw ‘rejoice’, and he sees it as a perfect match with the rejoicing figure. Certainly, but perhaps we can find a Semitic word for this slot. In this regard, Egyptian N (the water-wave sign that gives alphabetic M, pictured further down on this tablet, though reduced to a horizontal straight line in the hieratic script, as shown here immediately to the right of the rejoicer) was also employed to transcribe Semitic l, and so the the two Egyptian letters at the end (HN) could represent hl. Furthermore, the eagle-vulture representing 3 (’aleph) could stand for l (though it would normally be indicating a vowel, here ha or hi. Haring mentions the possibility of another N (and thus an additional l), and I can almost find *hillul, which I see as the word that gave HI in the West Semitic syllabary and H in the proto-alphabet (Colless 1992: 67). Still, the final hl might suffice to make the confirmatory connection that I have been waiting for, since 1988. Haring follows the standard line that the name of the letter is Hoy (or Hey, presumed to be what the man is shouting) and Hoy happens to be the Ethiopic name of the equivalent letter. Another Ethiopic letter name will be invoked in the next section. Notice in passing that the H-sign (hieroglyph O4, a field house) was one of the models for the letter B (bayt ‘house’; Hamilton 2006: 38-52); indeed, it was the one that survived into the Phoenician alphabet. Schneider thinks that a connection with Hebrew hll "praise", as proposed by Fischer-Elfert and Krebernik (2016:170), is unlikely, in the unattested form hlhl that appears here (apparently); instead he suggests a Semitic root hny "be pleasant", and here with causative ha- ("make pleasant"); I would still cling to the hll "exult" connection (hillulu "jubilation"), as the original reference for the character depicted to represent H /h/; and whatever the scribe has intended here, he has certainly written a term beginning with h (hieroglyph O4). We should keep in mind the supposition that each Egyptian syllabic transcription covers a Semitic word, whereas the classifiers are Egyptian. Accordingly, I think the symbol of the man rejoicing is meant to give us the sound of the first consonant in the series, perhaps by means of the Egyptian hy hnw "jubilate" (Gardiner, 493, with reference to A32 man dancing), though A8, with the man sitting, is even better, as it represents hnw "jubilation". Haring transcribes the text as rw (rawi) and looks for a word to go with the “curl or rope at the end”. Actually, it is an established idea that the original letter L was a ‘coil of rope’, corresponding to hieroglyph V1 (Hamilton 2006: 126-127). Also, Egyptian r was used to render Semitic l (more usually than n for l, as proposed in A1 above); remember that there was no ­l-sound in Egyptian. If we are looking for a word lawi, we can find it in the Ethiopic name for L, Lawi. Romain Butin noted this (Harvard Theological Review 1932: 146, and also Colless, Abr-Nahrain 1988: 44), and he pointed to a root lawa ‘wind, coil’ (as in Arabic); Hamilton records this in a footnote (2006: 136, n. 157) but he rejects the other possibility of a shepherd’s crook (S38, S39) as the prototype (2006: n. 148). However, on the two alphabets from Thebes, neither L has a coil: one has a crook (like S38) and the other has an inverted example of S39 (looking just like our l). It could be that they are allographs: either the coil and the crook are both original, or else one developed from the other. Note that the other four scholars (Sch, F-E, K, W-W) also invoke the root lwy here. Here the text is transcribed as h.rpt (note that when I place a dot after a letter it should be understood as actually being beneath the letter, in accordance with the standard transcription system for h., s., z., t., d.) The H. sign is M16 (clump of papyrus) used in Group Writing instead of the normal V28 (hank or wick), which became H in the proto-alphabet. Haring offers a proper name h.rpt in Ugaritic cuneiform sources, but he wonders how this and his other suggestions would relate to the sign on the left. He identifies it as “M22” (“a reed plant”) but the sign has two shoots on each side, whereas M22 has single shoots, and so this is M23 or M26 (sedge). If we search for Semitic h.lpt we discover h.lp, as a species of rush with sharp edges (root h.lp ‘be sharp, cut’) (Marcus Jastrow, Dictionary of Talmud etc, 456f) and ‘shoot’ (plural –ym or –wt) (Jastrow, 472a); it is cognate with Arabic h.alaf or h.alfa’, and it is especially found in Egypt; it is glossed as ‘Schilf oder Riedgras’ (Jacob Levy, Wörterbuch über die Talmudim und Midraschim, II, 63a). ‘Schilf’ is ‘sedge’ (Germanic sagjaz; sag-‘saw’). Schneider, Fischer-Elfert & Krebernik, and Wilson-Wright also read h.lpt "rush, reed", and connect it with Semitic h.lp (also Akkadian elpetu). Now, the sedge sign that comes at the end of the h.lpt sequence is not in any proto-alphabetic text that I have seen, though M22 with single shoots does occur in the West Semitic syllabary, apparently as mu, from mulku, ‘kingship’, after M23 nsyt, ‘kingship’ (Colless, Abr-Nahrain 1992: 82-83). Additionally (smudged and faded, and unmentioned by the other researchers), the Egyptian mansion-sign (06, h.wt) is placed here to reinforce the fact that the third letter in the series is H. (Het in Hebrew). Note that the Ethiopic name for this letter is H.awt., and this may be significant. The sedge might have served as an allograph for H. in the proto-alphabet, but my choice has always been the mansion sign for H., acrophonically based on h.z.r (Hebrew h.as.er) ‘court, mansion’ (Colless 1988:38-41). Its form in the alphabet in the Iron Age is an upright rectangle, divided into two squares; in the Bronze Age, the earliest form has the mansion with two rooms and a courtyard (sometimes rounded), but because it is a house it is usually, but mistakenly, placed in the B (bayt, house) category (Hamilton 2006: 48). This character (or its Egyptian model) apparently occurs here, to the left of the h.wt hieroglyph and the rush sign, as faint lines and dots. I have waited a long time for this confirmation, while others have been seeing H.et as a fence (Hamilton 2006: 97-102). Also in the vicinity is a small circle with a dot, apparently the head of a snake, with its body represented by a line extending to the wavy line (M); the snake is the letter N in the alphabet, and in the Alpha-Beta order of the letters the sequence LMN is at the half-way point, but in this Ha-La-H.a-Ma system only N is at the centre of the line; but this scribe is perhaps reminding us that M and N really belong together, implying that he knew the alternative order. Or we are seeing MN, another transcription of the word for water (see notes on line A4). Note that at least 18 of the 22 letters in the Iron Age (Phoenician) alphabet had a counterpart in the ancient syllabary (which likewise represented only 22 consonants) but this form of H. (mansion) is absent from the syllabary. It appears quite clearly in the top left corner of Thebes alphabet 1, and in the same position on Thebes 2 (but indistinct). Those documents portray a longer alphabet, it needs to be said.